When encountering someone with severe uncontrolled bleeding at home, at work, while driving, or related to a catastrophic event, such as an active shooter or explosion, there may not be time to wait for medical help to arrive. Recognizing life-threatening bleeding and knowing what to do until medical help arrives can save lives. 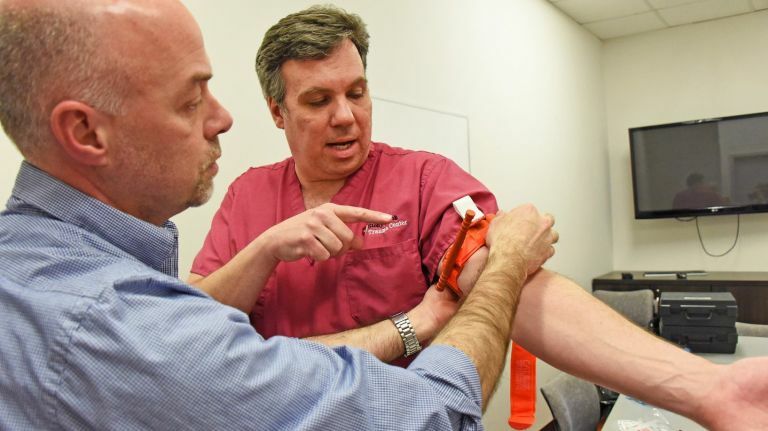 The Stony Brook Trauma Center offers a 90-minute American College of Surgeons’ Bleeding Control Basic (B-Con) training session to ordinary citizens as part of the national Stop the Bleed emergency preparedness campaign. Training sessions are being scheduled at various locations throughout Suffolk County. B-Con is a movement to train the general public in the recognition and immediate treatment of life-threatening bleeding began after the 2012 shootings at Sandy Hook Elementary School in Newtown, CT. In the wake of that tragedy, the federal government convened a series of meetings which resulted in a series of expert recommendations referred to as the Hartford Consensus. The Hartford Consensus included a review of a Department of Justice study of the 160 active shooter incidents in the United States from 2000 to 2013. Based on the results of the Hartford Consensus, the White House urged the training laypeople on how to determine if bleeding is life-threatening and how to stop it using tourniquets and wound-packing techniques primarily utilized in combat environments such as Iraq and Afghanistan. B-Con focuses on high-risk active shooter areas (commercial areas and school systems) and is designed for laypeople who may be called upon to bridge the gap from time of injury to arrival of professional first responders, much like was seen in the initial response to the Boston Marathon bombing, and of course the recent active shooter in Las Vegas, Nevada. However, it is far more likely one will need or use the skills learned in the event of an accident or injury suffered in the home or workplace. As the highest level ACS verified trauma center in Suffolk County, Stony Brook Trauma Center is ideally suited to lead this training, and has recently partnered with the Suffolk County Police Department’s MEDCAT unit to assist training the public. With ongoing support from Stony Brook University Emergency Management and the Suffolk County Police Department, we have trained approximately 3,000 members of the public since October 2016.